Get fitted for your custom hoop for workouts and play! Have you heard media telling you that you'll get fitter, tighter abs with the biggest, heaviest hoop? NOT TRUE! Here's why you need to be fitted for your hoop. I start true beginners in the bigger 3 lb large hoops to get moving and get muscle memory. The bigger the hoop, the slower the rotation, the more time you have to learn. Ahhhhh! Once they have it, I move them into a lighter 1.5 lb hoop for more challenging workout. The better you get at waist hooping, the stronger your core. The lighter the hoop, the faster the rotation, the bigger the challenge and workout. PLUS you have a dominant and non-dominant side, so go both ways! I want you in a custom hoop for fun fitness at home and away! Hoops can be picked up in St. John's, NL or can be shipped anywhere in Canada with a $20 shipping fee. 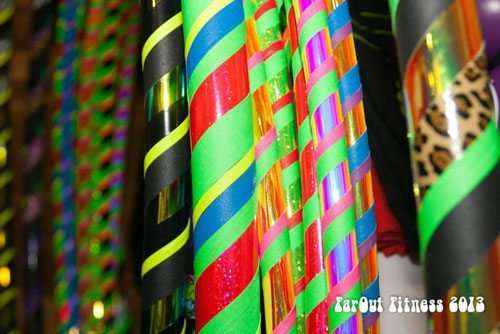 If you have a colour preference for your hoop(s) tell us! Shipping: Anywhere in Canada. A $20 shipping fee applies. Pick-up: Hoops can be picked up at arranged time and day. 30 Ropewalk Lane, St. John's, NL in Power Conditioning Inc.
Will hoop be shipped or picked up?